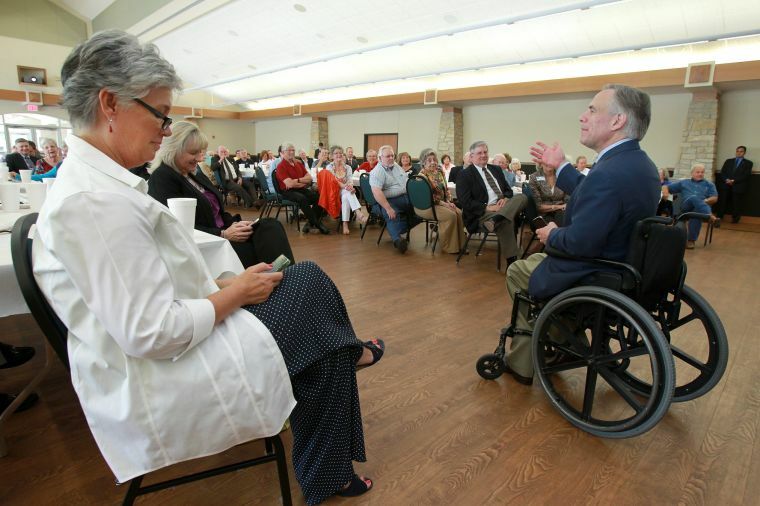 Texas Attorney General Greg Abbott speaks Monday to the McLennan County Republican Club at Knox Hall in Waco. Janet Jackson (left), who represents Senate District 22 on the Texas State Republican Executive Committee, checks her smartphone after Attorney General Greg Abbott asked the audience to post his comments on Twitter. Texas Attorney General Greg Abbott told a Waco audience Monday he would sue the Obama administration to protect individual gun rights if the U.S. joins a United Nations global arms treaty. Abbott also said a group working to make Democrats more competitive in Texas represented a “far more dangerous” threat than anything uttered by North Korean leader Kim Jong Un. The comments came during a lunchtime speech to the McLennan County Republican Club that featured frequent criticisms of President Barack Obama’s efforts on gun control, health care reform and environmental regulation. Abbott, who has written Obama threatening legal action against the treaty, said the pact would empower the U.N. to regulate the sale and transfer of firearms and create registration lists of gun purchases. The stance won the Republican attorney general one of several standing ovations from the friendly crowd. It also echoed concerns raised by the National Rifle Association, which opposes the treaty. Proponents say the treaty would tighten controls over the flow of conventional arms across international lines to keep them out of the hands of terrorists, drug traffickers and criminal cartels. Abbott also weighed in on Battleground Texas, a group formed by veterans of Obama’s presidential campaigns hoping to make Democrats more competitive in Texas, where the party hasn’t won a statewide election in nearly two decades. Battleground Texas realizes Republicans can’t win a presidential election without Texas’ 38 electoral votes, which makes the state “the last line of defense” in protecting the country’s future, he said. In an interview after the speech, Abbott said he made the comparison to North Korea partly because he doesn’t think the country is a serious threat to the U.S. He also wanted to stress the idea that “complacency kills” in politics, he said. “Republicans who are complacent are kidding themselves if they think Battleground Texas is not a threat,” he said. Democrats hope demographic changes, especially a growing Hispanic population, will help them become more competitive in coming decades. 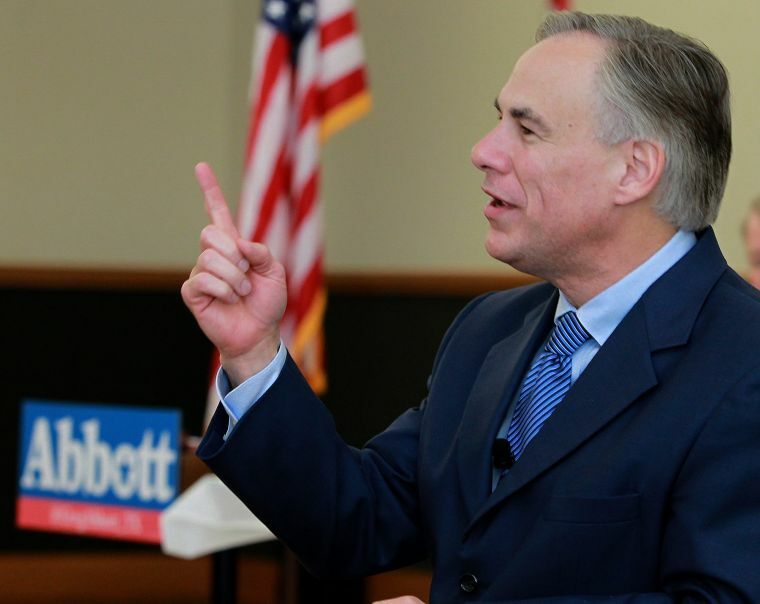 Abbott said Republicans can combat Battleground Texas by connecting with Hispanic voters who share common values. Abbott bragged that he has sued the Obama administration 25 times and highlighted his victories in killing environmental regulations he called unreasonable. Abbott’s lawsuits against the Obama administration had cost the state $2.58 million and more than 14,000 hours spent by staff and state attorneys as of September, the Associated Press reported. He has defended the costs as necessary to defend Texans’ rights, protect jobs and promote industry. Abbott has collected millions of dollars in campaign funds and often is mentioned as a potential candidate for governor in 2014, especially if Rick Perry chooses not to run for a fourth full term. Abbott declined to discuss his political future Monday, saying he was focused on the current legislative session, which ends May 27. “We’ll think about politics after the session’s over,” he said.